Sitting pretty in Edinburgh’s West End, The Hampton Residence is ideal for your next visit to Scotland’s capital. Sleeping up to four guests, this one bedroom, first floor apartment benefits from free parking and plenty of space. The generously proportioned living and dining area boasts modern leather seating (extending to a sofabed), TV with Freeview, CD player and unlimited WiFi. The dining table comfortably seats up to four people, and the large window has a pleasant outlook. You’re invited to cook up a storm in the contemporary kitchen, which is fully fitted with all mod cons, including washer/dryer. 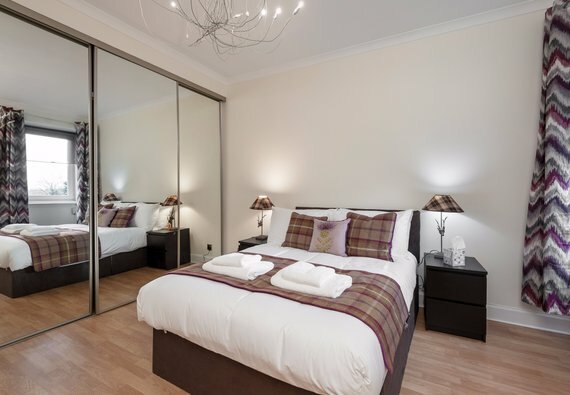 The master double bedroom features charming Scottish touches and has plentiful guest storage. A family bathroom with shower over bath completes this delightful home from home. In terms of location, The Hampton Residence is fabulously placed just a mile from the city centre. You can find yourself amidst the medieval Old Town or Edinburgh Castle within a 20 minute stroll, or you can hop on one of the frequent buses departing from the main road. Haymarket train station is practically seconds away in a taxi, and the Airlink aiport bus also stops on the main road. Exterior Access is from front main door and from car park at the rear of the house. Interior layout A central hallway leads to a living/dining room, separate kitchen, double bedroom and family bathroom. No reviews yet for The Hampton Residence.